Welcome to the official discussion thread for escapeVektor: Chapter 1 on the Wii! To start, please add this game to your log, add it to your collection (if applicable), and (when you are ready) rate it using the link above! What a fantastic WiiWare game. Although this game has now been rendered somewhat obsolete by the release of the full 3DS version (the WiiWare game only contains chapter 1), I've been enjoying this game a lot as I'm working my way through my WiiWare backlog. 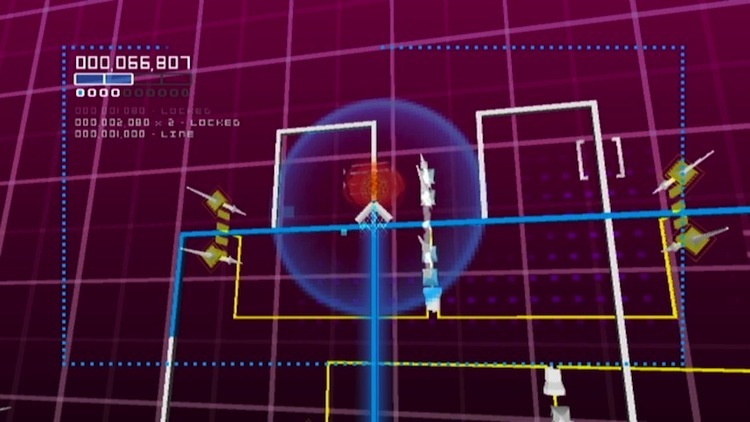 The game can be described kind of like a cross between Pac-Man and City Connection. And that's just the starting premise of the game. Different enemy types will track you down or 'patrol' the areas, there are a number of different environmental hazards to watch out for, switches will appear that will toggle deadly force field barriers, numerous alternate exits to keep you coming back again and again... it's all there. I love the music! The presentation is fantastic, especially with pulsing, vibrant, computer environments you're navigating. It's great how your little vector ship upgrades gradually as you make your way through the levels. The back story is also pretty interesting and mysterious. I like the way the camera rotates yet keeps a good angle. I definitely recommend playing with the Classic Controller, as it's a pain to press the B button on the Wii remote in horizontal position in order to zoom the camera out. In world 3 I'm having some difficulty with level 5; it's timed, and you have these switches that will deactivate a deadly force field for a short period of time. The drone enemies simply follow a set path, so they're not too bad. But you need patience while also choosing the optimal path to make it before time runs out. I may skip this stage (optional) since I'm not having such a hard time going through the remaining stages. I do like the variety in the levels and the different enemies and obstacles. I'm in world 4 now, and level 3 is pretty crazy, but I like the challenge. There are a bunch of enemies patrolling the area, and lots of deadly traps and switches on too of it all. This game really keeps you on your toes and making sure you're paying close attention to all your surroundings. What's even trickier is when an enemy is chasing you and they trigger a force field just in front of you, resulting in instant death. Man. I really, really like this game. Has anyone played the 3DS version? I'd be interested in knowing if the extra content is worth the $10 asking price. Awesome, got my 100% on all five of the main worlds. There are also the World 6 extra challenges, which are pretty tough. I cleared some of them (they were just repeats of previous levels but with stringent time limits), but I got stuck on one level that threw in a new mode called 'Eraser.' On this one, if you go back over a path you already cleared, it becomes 'uncleared,' so you can imagine the frenzy of going back and forth over lines trying to 'claim' them if you're not taking the optimal path (while also avoiding enemies and hazards!). I haven't tried out the 3DS game. But considering it has 150 levels (according to the escapeVektor website) spread over 27 worlds (vs. the WiiWare game which only has 30 levels spread over 5 worlds), I would think it's worth the price! I have it on WiiWare. It's not bad, though I'm not sure that it ever "clicked" for me.